Other financial planning programs ask you to guess: How much do you need for a secure financial future? MaxiFi software ends the guesswork. It’s the only software powerful and accurate enough to calculate your highest sustainable living standard — starting today — with a plan to maintain and raise that amount — for life. 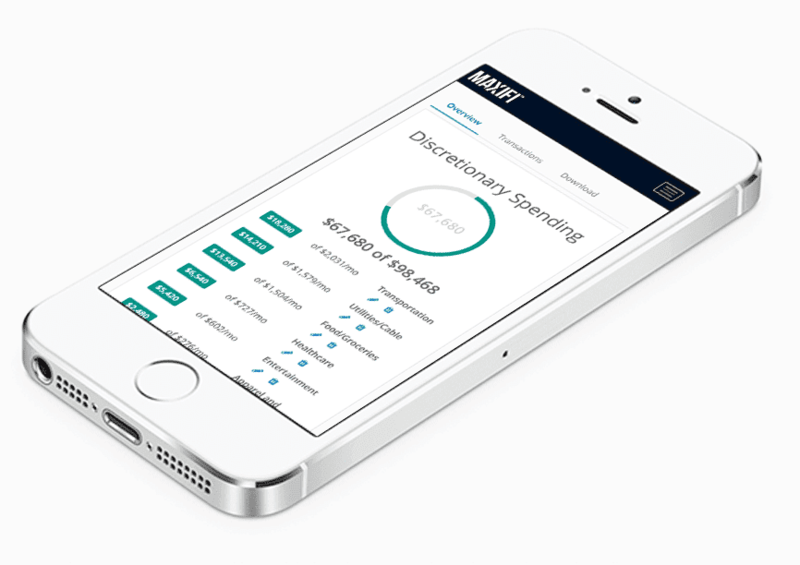 MaxiFi analyzes your financial future. It calculates a spending, saving and insurance plan to maintain and protect your living standard for life. 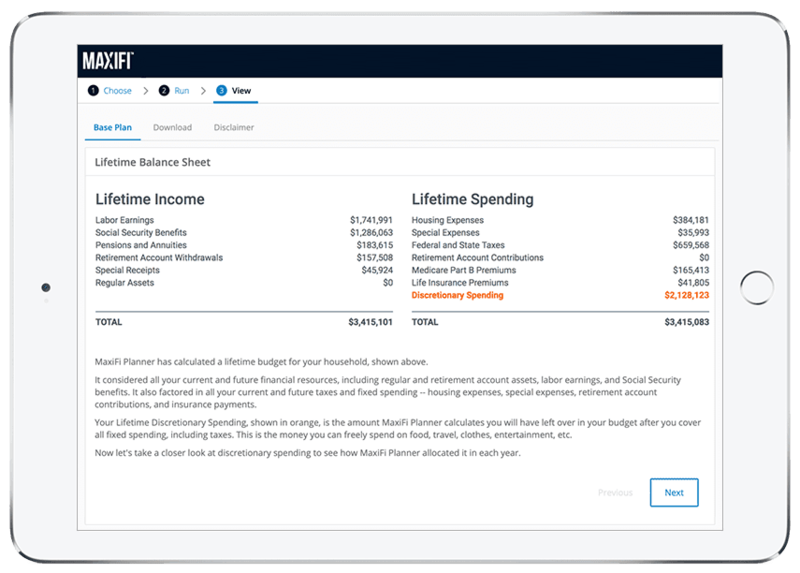 MaxiFi can raise your lifetime spending by tens to hundreds of thousands of dollars by optimizing Social Security, lowering lifetime taxes, and more. Changing jobs? Moving homes? Planning retirement? See how big decisions impact your living standard––now and for the rest of your life. Conventional financial planning products use simplistic, outdated “rules of thumb” to “guesstimate” income needs in retirement. They don’t calculate what you can afford to spend every year over the course of your life. We do. 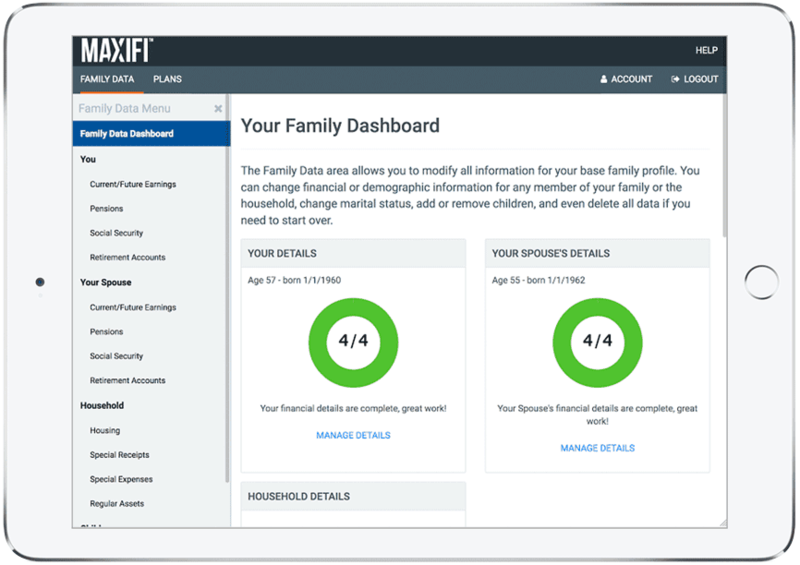 MaxiFi analyzes your current and future finances using powerful algorithms developed by acclaimed economist Laurence Kotlikoff. We consider earnings, assets, retirement accounts, taxes, Social Security, housing, and other fixed spending to calculate annual discretionary spending budgets that preserve your living standard. These changes can mean tens to hundreds of thousands of extra dollars in lifetime spending. Take the guesswork out of financial decisions at every stage of life––whether you are just starting out, building a family, considering when to retire or wanting to stretch your retirement dollars further. 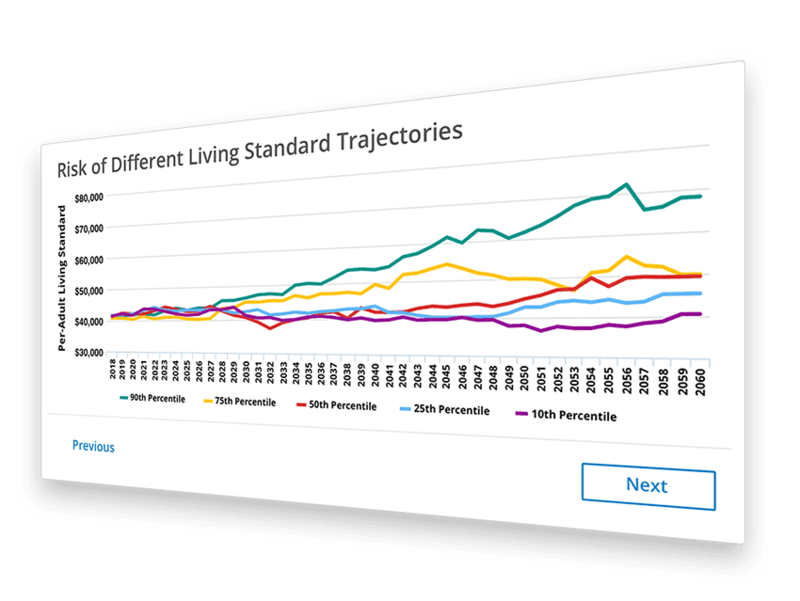 Run unlimited “What-If“ scenarios to see how different decisions impact your overall financial plan and sustainable standard of living. Clear charts of annual lifetime income, fixed and discretionary spending, taxes, Social Security benefits, and insurance let you dig into the details. When you're happy with your plan, set up your Progress Tracker for the year with a few clicks. This tool helps you visualize and stay on track with your income, spending, and saving targets for the year. You can review and update your progress at any time from any device, or export your targets and transactions to Excel. Investing is risky business. So is spending. Both can be too aggressive or too cautious. 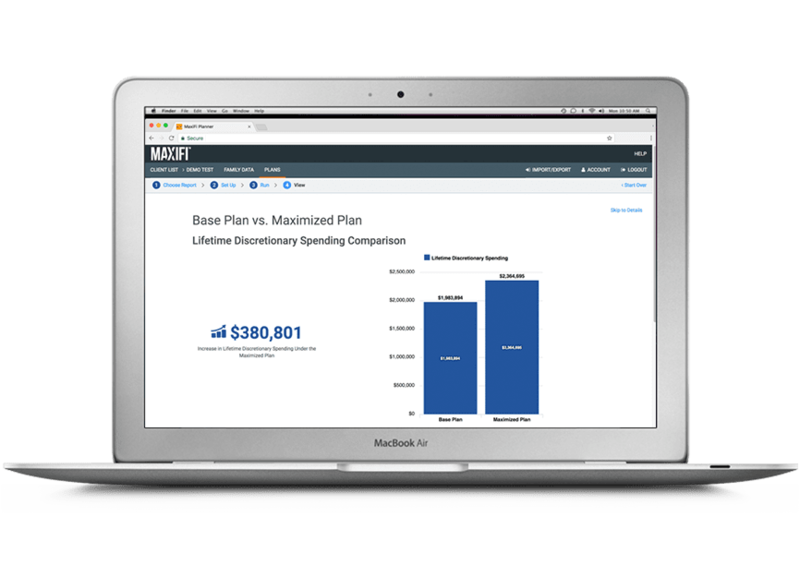 MaxiFi’s Monte Carlo simulations let you compare the living standard risk and reward from different investment strategies and spending behaviors so you can make smart decisions. Conventional financial planning tools use old-school Monte Carlo. They set a spending target and never change it to reflect reality. Our state-of-the-art Living Standard Monte Carlo incorporates changing investment returns. If returns are low, MaxiFi adjusts discretionary spending so your living standard remains stable. If returns are high, MaxiFi adjusts spending to reflect improvement.